James W. Tufts commissioned Boston architects Kendall, Taylor & Stevens to design the Carolina Hotel, completed in 1900. Annie Oakley lived here while giving shooting lessons in Pinehurst in 1922. 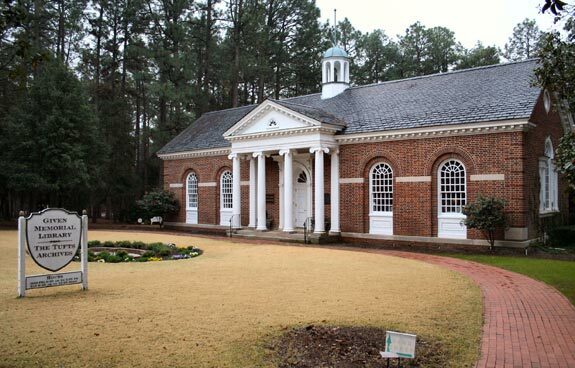 PINEHURST, N.C. – A little over a week from now, college basketball will have crowned its champions, baseball will be in full swing and the first of golf’s four major men’s tournaments will be played at the Augusta National Golf Club, that bastion of well-pruned privilege. You may wonder what this has to do with collecting. 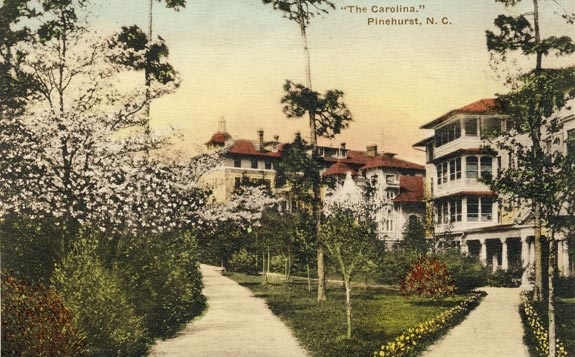 I wondered the same until I found myself in Pinehurst, N.C., a town so unchanged from a century ago that it resembles a hand-tinted postcard. Developed as a winter retreat for sporty northerners by James Walker Tufts (1835-1902), the Boston soda-fountain magnate and maker of Tufts silver-plated tableware, Pinehurst is a living monument to golf, a British import with a storied past, as well as a beautifully preserved manifestation of the American country-house movement. Tufts’ genius was thinking big. After finding a sunny spot with enviable rail connections to the Northeast and Midwest, he bought up more than 5,000 acres of partially timbered pine forest and hired the firm founded by Frederick Law Olmsted to create a New England-style village on one hundred lushly landscaped acres. He completed the hat trick by recruiting Donald Ross, the Scottish-born designer of more than 400 classic courses, to be Pinehurst’s first resident pro in 1901. 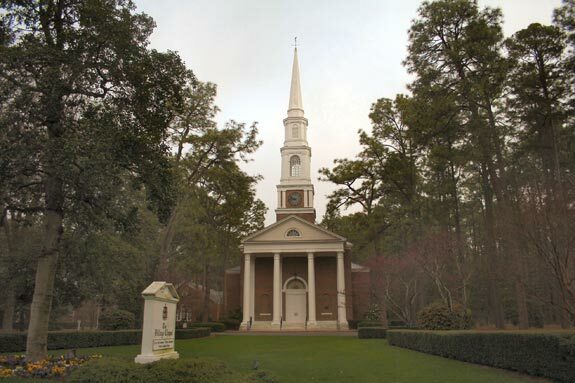 The Ross association runs long and deep in Pinehurst and neighboring Southern Pines. 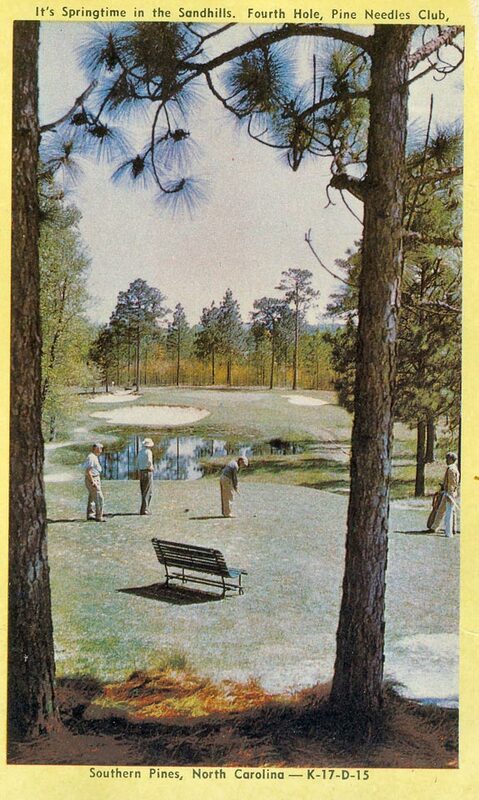 Visitors can play several Ross courses, including the famed Pinehurst #2, completed in 1907. 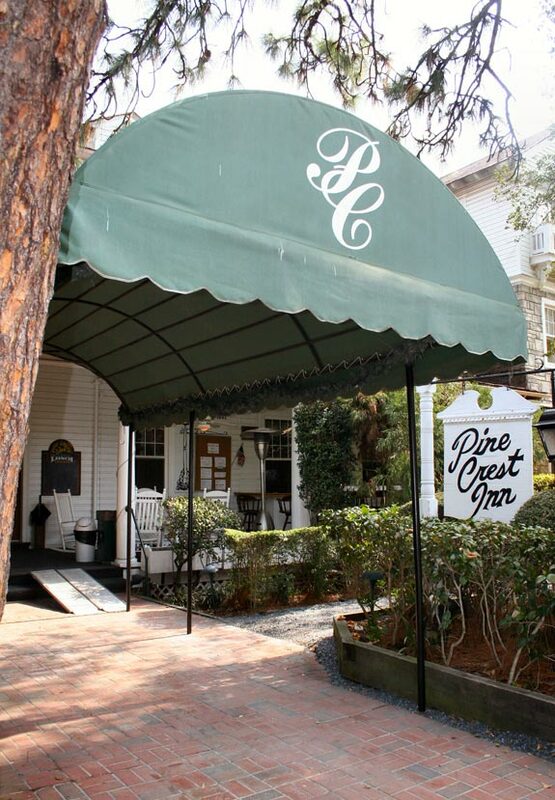 They can tuck in for the night at the homey Pinecrest Inn, operated by Ross from 1921 to 1938, and pore over more than 300 original field sketches and course layouts by Ross at the Tufts Archives in the village of Pinehurst, named a National Historic Landmark in 1996. Collectors can even take a bit of vintage golf home with them. 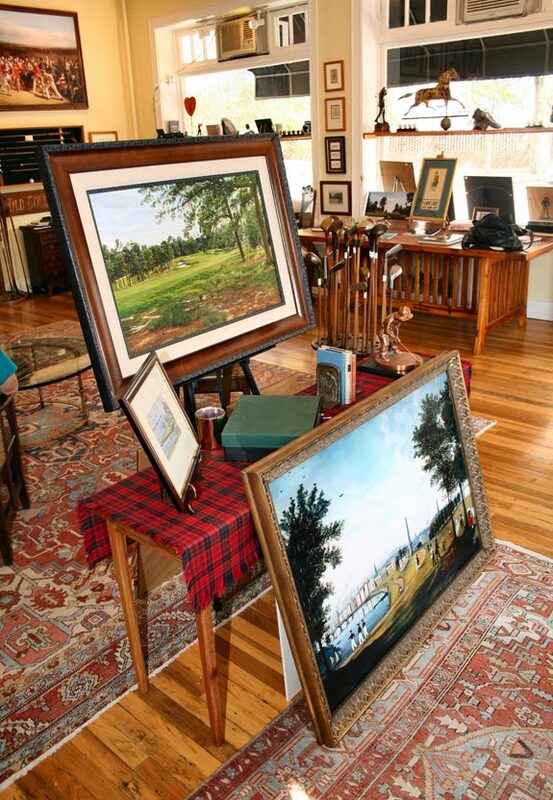 Pinehurst has two galleries devoted to golf art, antiques and memorabilia. 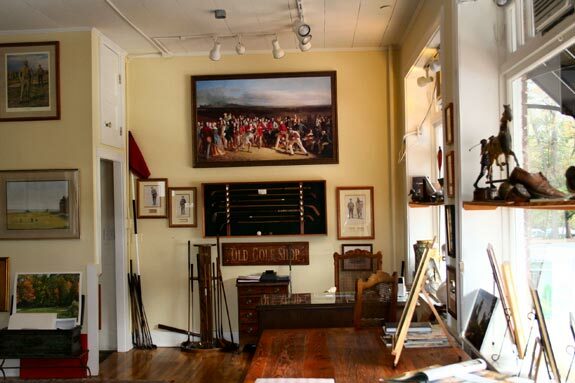 Robert Hansen, a collector and course developer who lives nearby in the old Ross residence, Dornach Cottage, presides over Old Village Golf Shop at the corner of Dogwood and Market Streets, where he sells antique clubs, paintings, prints, photographs and sculpture. 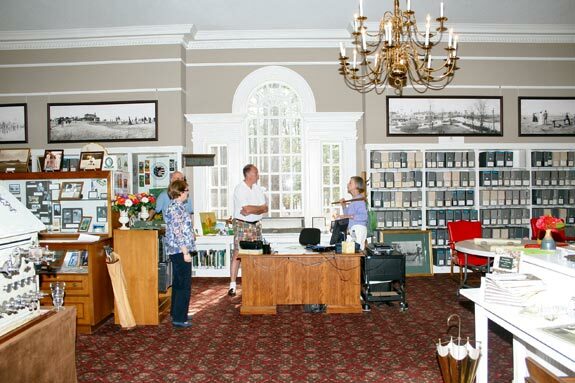 Several doors down in the 1898 Harvard Building, the Old Sport & Gallery stocks a large selection of historical prints, autographed books and photographs, and golf artifacts, including selections from the collection of the late Mort Olman, author of Olman’s Guide to Golf Antiques & Other Treasures of the Game. The shop’s founder, Tom Stewart, traveled the world as a professional golfer before settling in Pinehurst. Although the market in sporting antiques has slowed down a bit, outstanding collections still bring exceptional prices. In September 2010, Sotheby’s auctioned antique golf clubs from the collection Jeffrey B. Ellis, a golf historian and collector, for $2,166,209. At $181,000, the top lot was an 18th century Andrew Dickson long-nosed putter. Europe’s premier sporting auction house, Mullock’s, is offering golfing memorabilia on April 28 in Hoylake, U.K.Â Bonhams’ dedicated sale of golfing memorabilia is planned for June 1 in Chester, U.K.Â The Golf Auction, an online seller of golf memorabilia, closes bidding on its current sale on April 10. 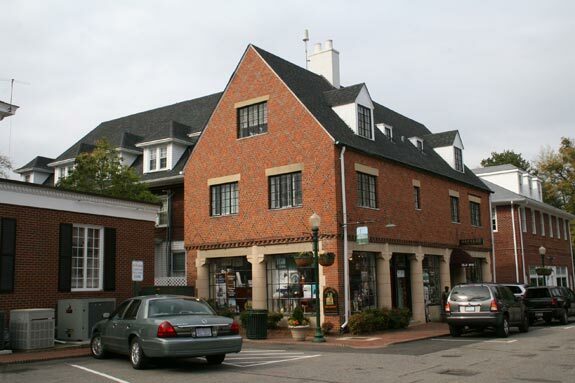 Old Sport & Gallery is contemplating organizing an auction to coincide with the 2014 U.S. Men’s and Women’s Opens, to be played in Pinehurst. 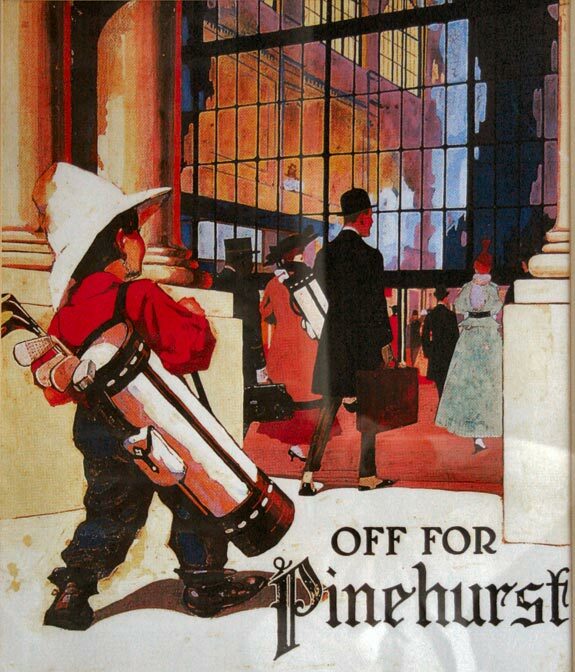 “Wholesome in every respect,” as Tufts liked to say of Pinehurst.